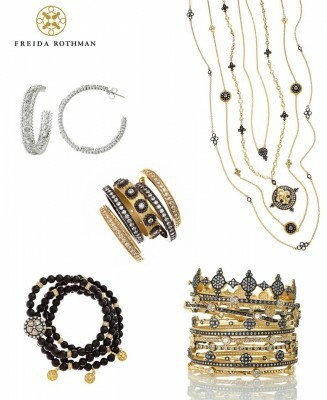 Freida Rothman is a New York City-based jewelry brand mixing classical and modern design. Catering to women from all over the world, Freida Rothman jewelry enables a woman to accent her personal style with added grace and charm, elevating her look from casual to sophisticated. The perfect mix between classical charm and big city glamour, Freida Rothman jewelry features a wide array of sterling silver necklaces, bracelets, earrings and rings with finishes ranging from 14K gold to platinum and black rhodium. Freida Rothman creates jewelry that fits into any woman’s lifestyle. Every piece is influenced by her own definitively cosmopolitan taste.